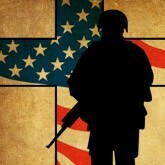 Thank you men and women of the armed forces and thank you Jesus! We live in an blessed nation. May God continue to pour out His blessing upon us. Let us not take that for granted.